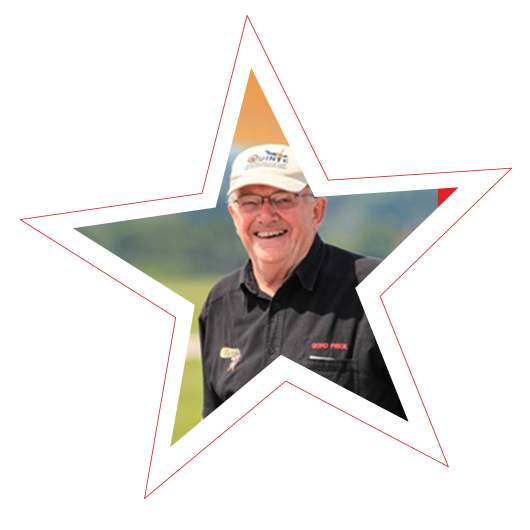 Gord Price has been performing airshows since 1976 now flying the prototype Yakovlev YAK -50 built at the Yakovlev Design Bureau in Moscow Russia. 77 years old still pulling +7 G and pushing -5 G.
RCAF 422 CF-104 ‘Starfighter’ Squadron Nuclear strike pilot from 1964-66. Represented Canada at 3 FAI World Aerobatic Championships… 1980, 82,88. Canadian National and/or Open Unlimited Aerobatic Champion 7 times. Flew 3 FAI World Aerobatic Championships obtaining the best standings of any Canadian pilot so far. Silver medal in Hilton Masters of Aerobatics. Pilots from around the world all flew the Pitts S2B. Pilots could not watch other competitors unless they had already flown. Judges did not know which pilot was flying the aircraft.